If you’re in debt, then it’s a constant worry and a scary place to be. It also doesn’t just affect your present, its effects will also span far in to the future. So getting rid of your debt should be a priority, but it doesn’t always work that way. There are often more immediate things that might take precedence over working towards your debt clearance. However, having a plan or strategy can really help you make a dent in your debts. Here are five ways to tackle it. Doing it yourself requires more willpower and self-control than most of the other methods. You take the minimum payments on all of the debts that you owe, apart from the one that you are targeting. Whether you’re taking the snowball or the avalanche method will determine which debt you target first. With the avalanche method you target the debt with the largest interest rate first, and with the snowball method you target the debt with the smallest balance first. Your plan needs to be clear and you need to seriously commit to clearing your debts within three years. Consolidation is essentially where you take out a loan to cover all your other debts. This way you only have to pay back one loan provider with one interest rate. Some debts are unable to be consolidated, but you may be able to consolidate them with a credit card or a personal loan. Be very cautious of the interest rates if you decide to consolidate your debts yourself as it can be dangerous if you can’t cope with it. This method still requires self-control as you still need to work to pay off your debt. 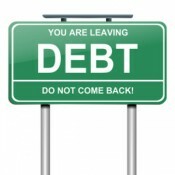 A reputable company will put together a debt management plan to help you get out of debt as fast as possible. A debt management plan works best if your creditors lower their rates after the fact. If they don’t, it may not work as well, but there are still benefits to a debt management plan. If your debt is too large to pay off within five years, and you fancy yourself as a good negotiator, then consider debt settlement. If you can pay upfront 50% of what you owe, you may be able to negotiate with your creditors to reduce the amount that you owe. This only works if you can get the money within around 24 months. There is often a debate between whether it is better to pay off your debts or to invest your money into retirement funds and the like. However, while the traditional advice of making sure that the interest rate on your investments is better than the ones on your debts is valid, it is often better to pay off your debt first. If you have a feasible plan to clear your debts within three years, and you have enough to invest at the same time, then investment may be able to make you money. Employing a wealth manager, like offshore investments from SPI, can help you manage your investments as well as your other assets and help make the most out of your money.